Photographs are historical documents. They capture a split second of a particular moment. A slice of life. Well, that’s not always true; especially in the age of Instagram filters and Photoshop. The history of the medium is filled with photographers who obsessively edited, altered, and cropped their images. In the darkroom and today on computers, light and shadow can be manipulated until the photographer is satisfied. Even what photographers choose to capture and print is very selective. One only has to look at the contact sheets of some of the most famous photographers to see the countless images that were left unaltered and never printed. 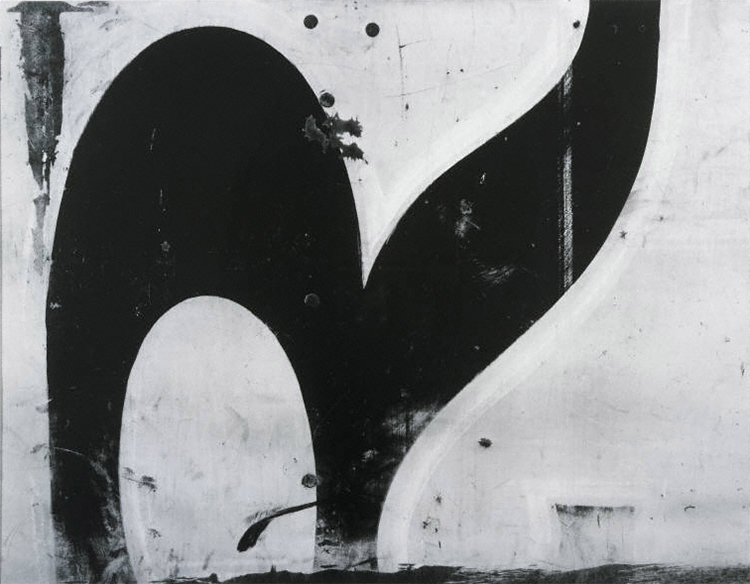 I first encountered Aaron Siskind’s Chicago 30 (1949) a few weeks ago. Currently located in the original house of the museum, the work sits above one of the old tiled fireplaces. First drawn to the dramatic contrast of black and white, I marveled at the work’s ability to capture and hold my attention. Photography always grabs me, but usually what I like about the medium is the ability to place the content within a time or a place. This photo is removed from all context. It is unclear what has been photographed by Siskind. The only hint of context is the title, Chicago 30. In the early years of his career, Siskind engaged with traditional documentary photography, often through a socially engaged lens. One of Siskind’s most well-known projects is the Harlem Document. The project focuses on documentation, but Siskind’s eye for artistry is present particularly in one of his most famous works, Savoy Dancers. Compared to his documentary work and given its lack of context and content, can Chicago 30 be considered a historical document? This photograph captures what Siskind saw through his camera lens, but we, the viewer, don’t know or understand what he saw. The work can be considered documentation of a particular moment in Siskind’s life, but without concrete information and context, the viewer is left only with the aesthetics of the photograph. This is a multi-part blog post; check back next week for Part 2. This entry was posted in Experiment Station and tagged Aaron Siskind, abstraction, imagery, images, photographers, photography. Bookmark the permalink.